It’s hard to pinpoint one specific reason for the Pistons’ misfortunes during this condensed 2011-12 NBA season. A glaring cause for concern, though, has been the inconsistent play from the majority of their young players. Surely, injuries and a general lack of depth have plagued the Pistons early this season. They’ve been without veteran reserves Charlie Villanueva and Will Bynum most of the year, and they’ve had to shuffle their backcourt rotation due to various injuries to guards Ben Gordon and Rodney Stuckey. The lack of health to the team has caused the Pistons to rely heavily on rookie Brandon Knight, who has been thrust into the starting point guard position after beginning the season as a backup to Gordon and Stuckey. Additionally, the team – along with the rest of the league – must endure the responsibility of playing a compressed schedule. Even with the low expectations they had coming into the season, the Pistons have disappointed fans by not only losing but being blown out most nights by their opponents. The Pistons, as a result of their struggles, have yet to commit to a set rotation. It remains to be seen who will start in the backcourt once Knight, Gordon and Stuckey are all healthy. Lately, it’s been Knight and Stuckey starting with Gordon out with two shoulder injuries. Frank has also failed to pick a consistent starter at power forward. Jonas Jerebko began the season as the starter, but he struggled early on with foul trouble. Detroit has since been opening games with veteran Ben Wallace in the starting lineup, though he is no longer capable of handling significant minutes during games. It’s possible reserve Jason Maxiell could wind up challenging for more playing time, and Villanueva could even earn the starting spot whenever he returns from a sore ankle. The bright side to a season like this is that it allows a team like the Pistons to give its young players plenty of minutes on the floor. While center Greg Monroe has emerged as the team’s best and most consistent player, Jerebko and forward Austin Daye have both battled through stretches of inconsistent play. 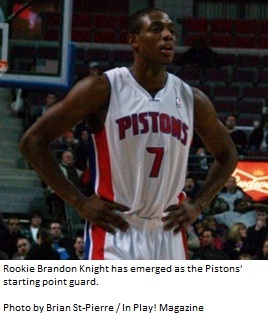 Even Knight, as a rookie point guard, is experiencing the ups and downs of running an NBA franchise. The Pistons aren’t kidding themselves. They know they aren’t going to be a playoff team this year. They also know that nobody feels sorry for an organization that was once an annual staple atop the Eastern Conference elite. Many believe the Pistons’ best bet is to continue losing games in order to increase their chances of landing a top selection in the upcoming NBA Draft. The players on this team, however, are only concerned right now with improving and turning the season around.